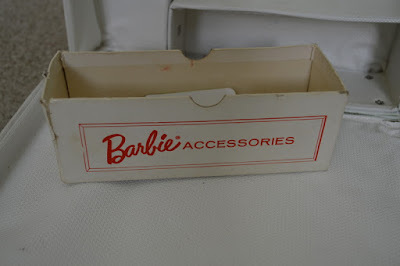 The Barbie Blog: New Barbie Things! It's been a while. But I finally get the chance to blog while the baby is sitting in his swing chewing on his ever-so-delicious hands. Babies are funny aren't they? My babes is growing up! He is in the 94th percentile for his length. It was like it was yesterday that he was just a teeny tiny little baby and all his clothes were too big for him. WAA! 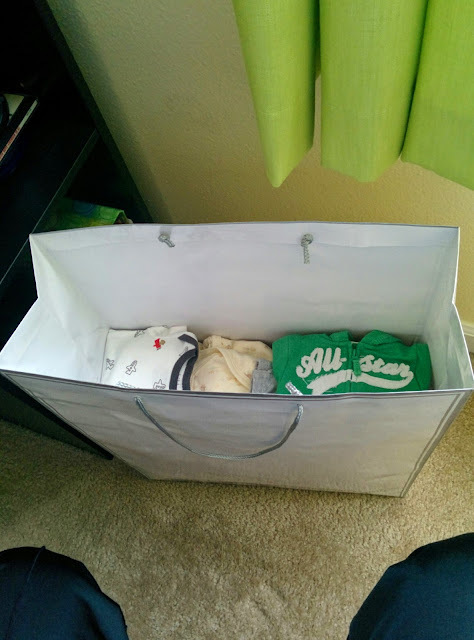 The "too small" clothes bag. Tear. Especially that little "All-Star" jacket on top. So cute. Wore it 3 times. More tear. Anyway, I have things today that made me joyous when I saw them! My dad goes garage shopping every weekend. He's retired so he is usually the early bird who gets the worm on Friday mornings when most everyone else is at work. I can't remember if I mentioned it before but my hometown is a serious treasure trove. And people want to get rid of this stuff for pennies on the dollar. Unlike where I live, people want to sell used shoes for $20. I don't know about you but when I go to a garage sale I want a serious bargain! And $20 is no bargain. That's the newest Ever After High doll purchase price! My dad scored the jackpot again. A few semi-vintage items. This case definitely falls into the vintage category. The year at the bottom says 1968. A little banged up however, but for a vintage item I can deal with that. When I opened it I saw this inside. Major score! Most cases are missing this cardboard piece or are damaged beyond recognition. Intact! 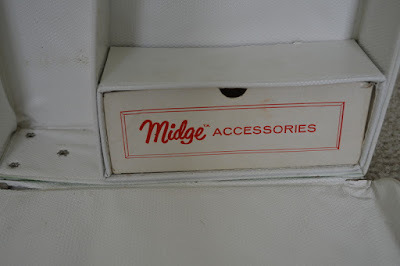 And for Midge! Wahoo! And if you turn it around...for Barbie! These cases my dad finds are awesome. 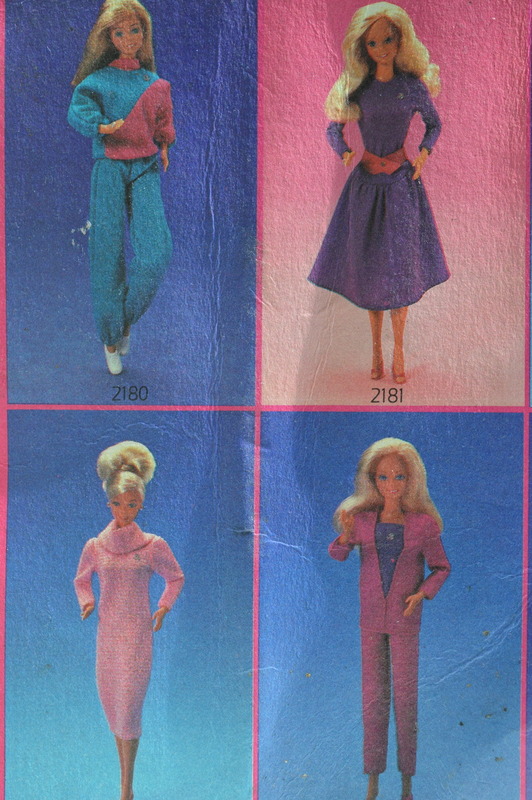 And now, some fabulous semi-vintage fashions. 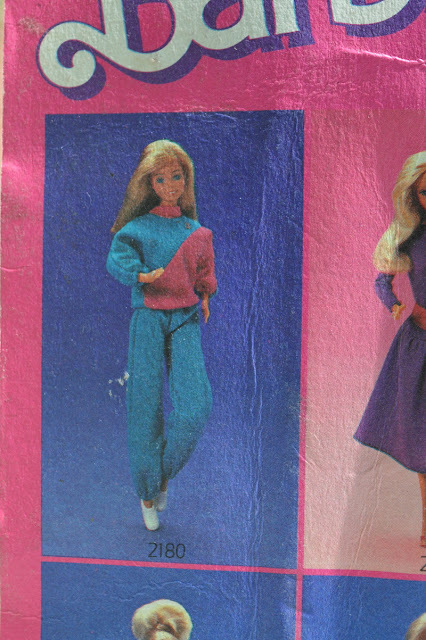 OMG, Twice as Nice fashions! I remember wanting these as a kid! At a whole whopping $1, this was a score. As I was squealing with delight, my dad said, "Now don't take it out! It will drop the collector value!" But for me, I have no interest in reselling my dolls. I have told my husband, the ONLY time I would sell my dolls was if we both lost our jobs and were in jeopardy of losing our house. Do NIB fashion packs sell for that much anyway? 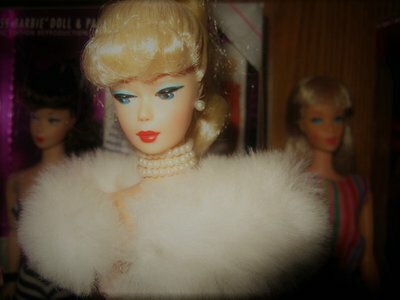 I can't wait till I can get my dolls out again. I have tons of old style body dolls that would look fabulous in this dress! 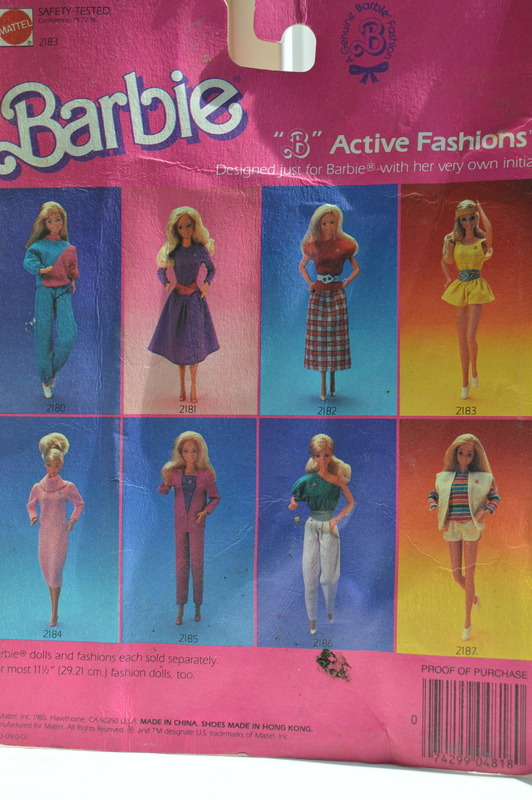 The back of the package showing the rest of the Twice as Nice fashion collection. Another $1 find was this "B" Active Fashion! As I've mentioned before, I have a soft spot for 80's active wear so this outfit is right up my alley. We have another instance where Mattel changed the color of the outfit for production. I like both colors actually. Purple and teal is a good mix. I remember when purple and teal was all the rage! 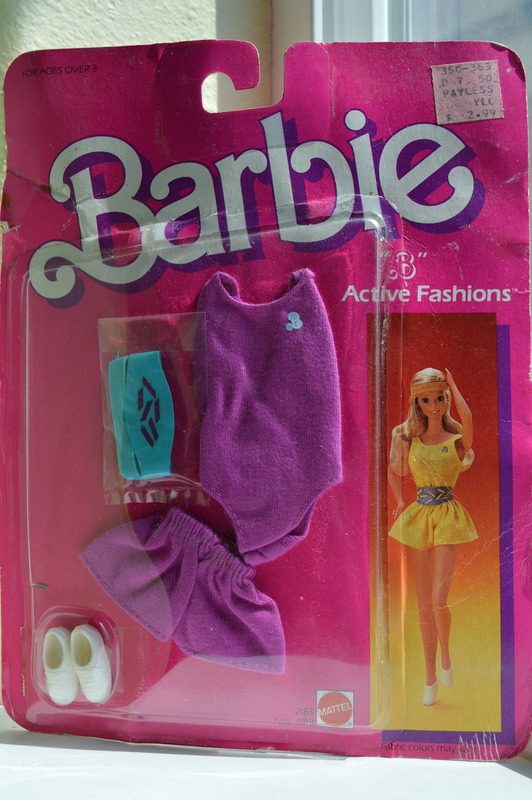 And this outfit comes with a headband! Love that! I already have a "B" Active Fashion in my collection. This two toned jogging suit. These other three outfits don't look like they would be a good choice for "active wear". The other outfits in the "B" Active Fashion collection. Check the one shouldered outfit lower right second one in! Super 80's! 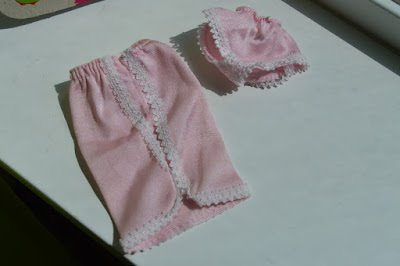 I'm not sure if this outfit goes with this package or not but it's a cute little pink slip and undies set. Packaging is "Barbie Best Buy Fashions." Is there more that goes with this set? Anyone know? I found this amusing. On the back of the package for this Best Buy Fashion is a tutorial on "how to dress your doll." 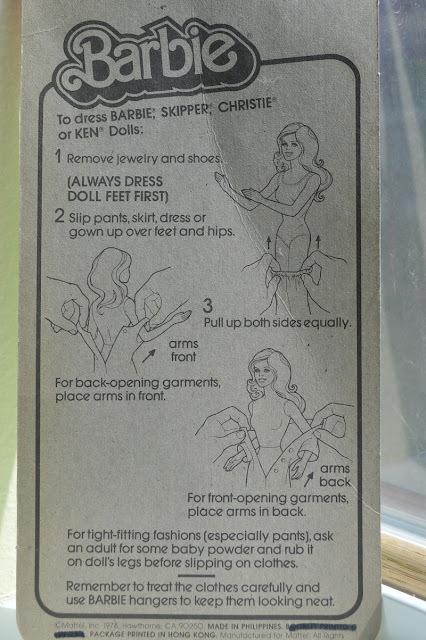 I guess this makes sense because we all know how hard it is sometimes to dress those dolls with permanently bent arms! 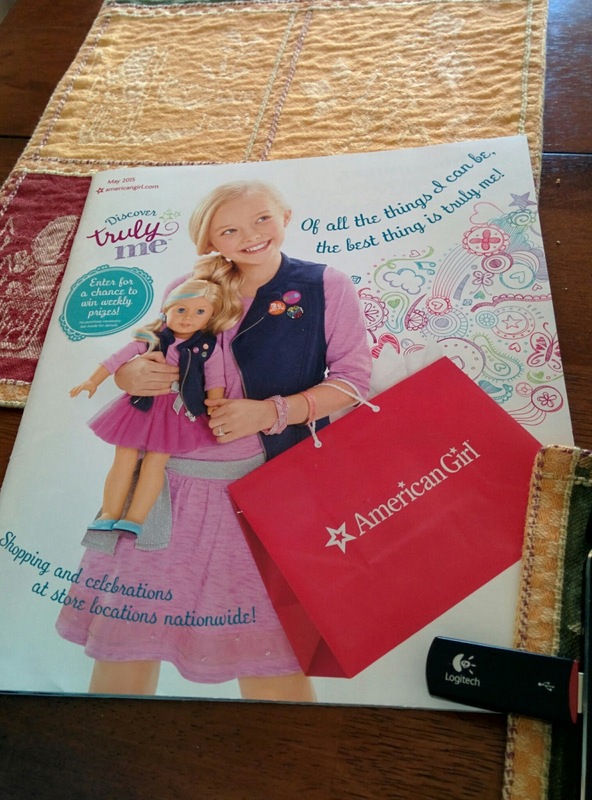 I also received in the mail this American Girl catalog. 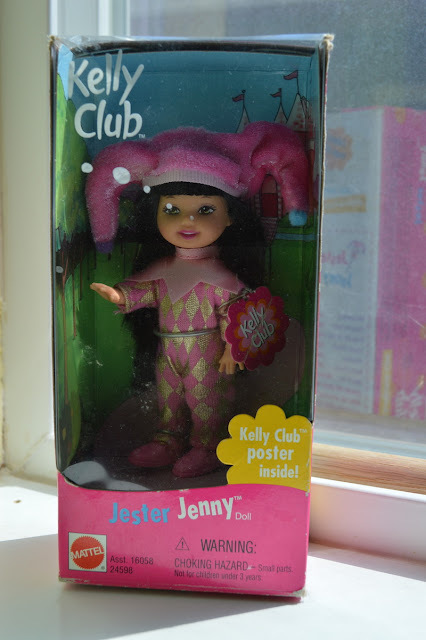 I remember getting these as a kid and dreaming of the American Girl doll that I would never have (because they are so expensive!) I am glad that they now have other store brands that are more cost effective. I remember being so in love with Samantha! If you are an American Girl collector, Caroline is going into the archive soon. Get her now while you can! Ever After High update! Because I'm OBSESSED! Four new basic wave dolls are out and ready for purchase! I've only found them on Amazon and they go out of stock as soon as they come in. So I'll have to wait to add them to my collection. Faybelle Thorn, Darling Charming, Allistair Wonderland and Bunny Blanc! Darling Charming is my favorite of the 4 but it is nice to get another male to the line! Also out are the "Way Too Wonderland" line. 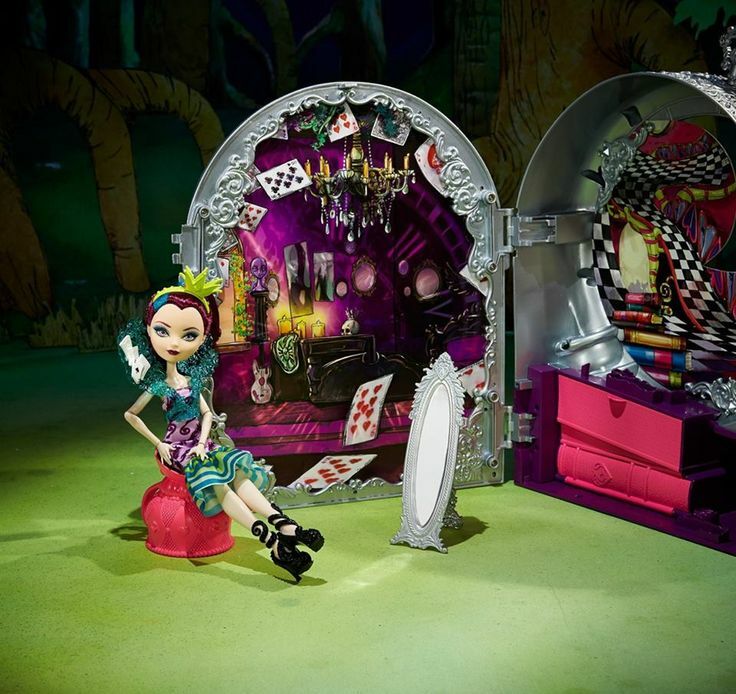 And they have added a fabulous playset with a new "Way Too Wonderland" doll. Just for us Raven Queen fans! Gah, why do they do this to me? Don't you love her? The cards on the collar? The shoes? I've also seen images of a Way Too Wonderland Briar Beauty. Not sure if they are for real but we shall see! So, a while ago I did have a hankering to work on my Benny doll again. Until I realized that my sewing machine is packed up because we are in the process of selling our house and moving. So he will have to wait. But I do have another project that I am going to work on with my Duchess Swan doll. I'll be working on that in the next week or so (pending on if baby is fussy or not). So I'll hopefully be putting that up soon! 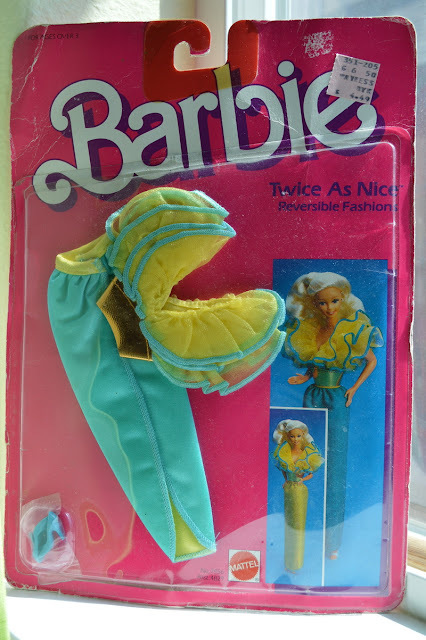 Friends, do you have any of the Twice as Nice or "B" Active fashions? What do you think of Way Too Wonderland Raven Queen? Let me know in the comments! Awww, I had a wave of recognition about the "too small" baby clothes bag - yes they grow up so fast :) but, it just get better and better as they grow :) he is beautiful and you are obviously in love, how wonderful! I actually really like Wonderland Raven. I saw a close-up of her collar yesterday, it's beautiful. All the dolls from this wave are amazing, sadly I'm still on a drive to radically cut down on my doll spending so I'm not sure when or if I'll be buying. Jacob is so cute! I remember the too small bags well. Babies seem to grow every time you turn your back at that age. You have an awesome dad, scoring those great finds for you, congrats! 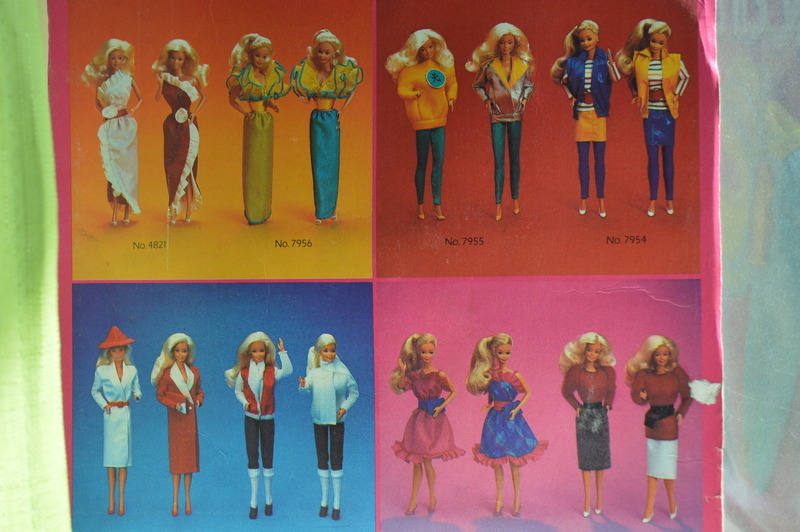 I did have a lot of the Twice as Nice Fashions, but I only kept a few of them like the first two in the top row. On the yellow/silver jacket the silver foil sadly started flaking of soon. Raven looks very tempting, actually all of the "Wonderlanders" do. Barbielea - I don't think I would have the drive to cut down on doll spending. If I had my way, I would work more money into my budget FOR spending! Ha! Yeah, I'm going to take them out. 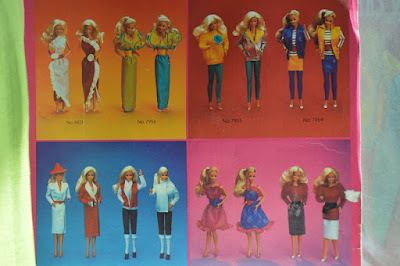 I can't wait for the time to come when I can dig into the bins again for naked dollies to fill these awesome fashions! Andrea - Thanks for the tip on the printed box! I'll have to stick it in the other vintage trunk. I had a jacket from another doll where the foil was flaking off too. Do you think it's because of heat and/or moisture? Unfortunately all of the leatherlike fabrics are prone to flaking off. Maybe it is due to age or heavy use in play, maybe someone washed them before. Washing these clothes is a majorly bad idea, they seem to disintegrate directly after drying, I learned the hard way. 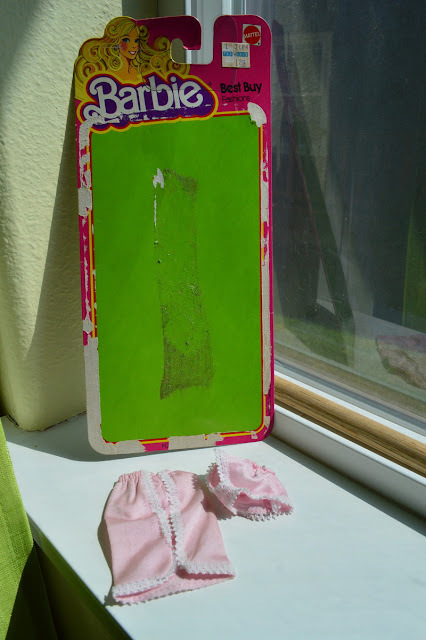 I'm really enjoying reading your barbie blog! I wish i could go garage saling with your dad; he finds some great scores! 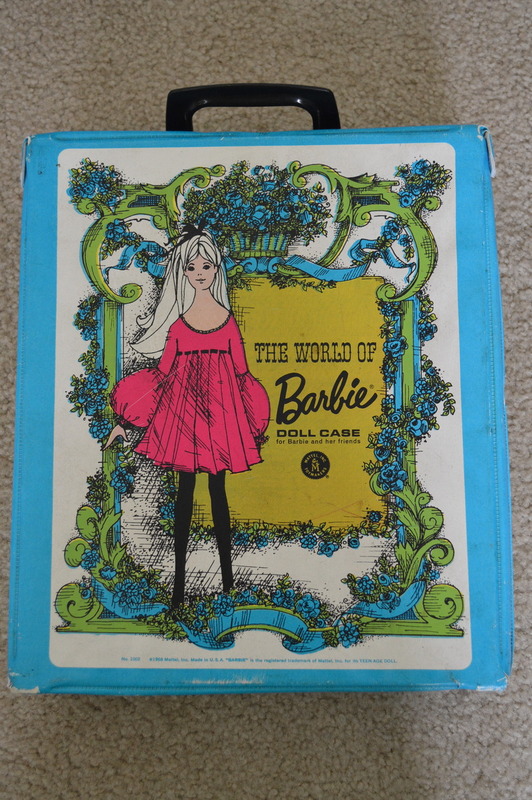 It's nice to know there are others out there, as passionate about dolls and barbies, as I am! Hi Party! Oh yes, there are MANY of "us" :) I too didn't know about anyone so passionate about dolls until I started this blog and met some awesome collectors! My dad is the ultimate garage saler. He scores stuff that I would never find. This last Christmas he found a vintage collector who was liquidating her collection and he scored some deliciously vintage dolls and clothes. LOVE! This is definitely a passion of mine and one that I will continue till the day I die. So glad you found this blog and keep checking back, I'll have more posts up in the next week or so!